Just like last year, the pervasiveness of iPod accessories and iPod-compatible gadgets at the massive Consumer Electronics Show makes clear the influence of Apple’s iconic media player. Everywhere you walk in Las Vegas this week, you come across yet another case, adapter, clock radio, or speaker system. Most, quite frankly, aren’t much different from what we’ve been seeing for the past few years, but a few stand out from the crowd. Here’s a look at some of the iPod-related products and technologies that caught my eye during my time at CES this past week. Last fall, iBiquity, the developer of HD Radio, announced a clever new technology called iTunes Tagging. With a compatible iPod audio system, whenever you hear a song you like on an HD Radio station, pressing a Tag button “tags” that song—that is, it stores information about the song in the system’s memory. The next time you place your iPod in the system’s dock cradle, information on tagged songs is transferred to the iPod. When you sync your iPod with iTunes, that information is then automatically transferred to a Tagged playlist in iTunes, from which you can purchase the tracks from the iTunes Store with a click of a button. This week, we’re finally seeing audio systems that take advantage of this new technology. 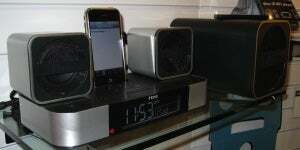 Polk added the feature in its updated I-Sonic Entertainment System 2; JBL introduced the On Time 400IHD, an iTunes-Tagging iPod alarm clock (shown on the right); and even JVC and Sony have adopted the feature (which also means, notably, that they’ve introduced iPod-docking products). But perhaps my favorite application of iTunes Tagging, given that I do most of my radio listening in the car, was from Alpine, which was showing a line of car-audio head units—the iDA-X100, -X200, and -X300 ($100, $200, and $300, respectively)—featuring iTunes Tagging and iPod connectivity. The only drawback is that each requires the separate Alpine TUA-T550HD HD-Radio tuner. It’s tough to judge audio quality in the environment of a trade show, so I look forward to putting the i30 through its paces when our review sample arrives. 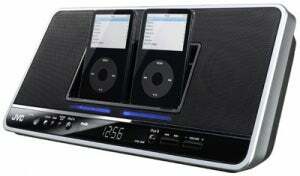 Way back in 2005, iHome released what was then a very unique product: the iH5 iPod clock radio. Since then, the company has diversified into all manner of iPod-related audio systems, and if iHome’s private showcase room at CES is any indication, the company is showing no signs of slowing down. Among the myriad products on display, a few stood out. The $99 iP14 is a compact clock radio designed specifically for the iPhone and iPod touch. Used normally, your player stands vertically in the requisite dock cradle. But if you want to watch video, you simply rotate the system 90 degrees so the screen on your iPhone or iPod touch is oriented horizontally; the iP14’s clock display automatically rotates, as well, to remain upright. 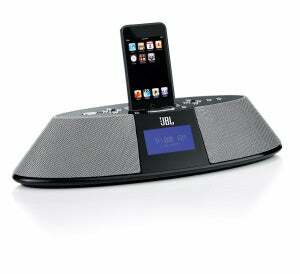 The $149 iP70 is a set of traditional left and right computer speakers with a twist: the left speaker features a built-in iPod dock in the front; you can even connect the speakers to your computer via USB to sync your iPod. Finally, the $159 iP51 (pictured above) is yet another clock radio, but one that foregoes built-in speakers in favor of a subwoofer and small satellites; the sub is specifically designed to be small enough to slide under most beds. We’ve seen a number of car-audio head units that integrate with an iPod, but Pioneer’s upcoming AVIC-F500BT ups the ante with voice control for both iPods and Bluetooth mobile phones. For example, according to Pioneer, you can say “play U2” to listen to track by U2; the system recognizes artist, album, playlist, and track names, as well as genres. Pioneer also claims the system recognizes “conversational” commands, so even if you stumble or stutter, it can understand your mutterings. It used to be that iPod integration was the purview of smaller vendors, while the biggest names in consumer electronics focused on their own products—which often competed directly with the iPod. We saw a few exceptions last year, but 2008’s CES brought a deluge of big-name companies embracing the iPod. 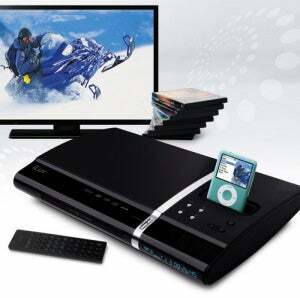 For example, JVC introduced four new flat-panel TVs each with a built-in iPod dock in the base. Ranging in size from 32 to 52 inches, the TVs let you watch your iPod’s video and photos through the TV and control playback using the TV’s remote. Given that iPod video is currently limited to less-than-HD resolution, this isn’t as compelling a combination as it could be, but I’m holding out hope that we haven’t seen the best the iPod can do in this respect. JVC also announced several audio systems with iPod-docking features, including the $150 PN7 (shown on the right), an iPod clock radio with two iPod docks—a handy feature for charging if you’ve got multiple iPods or an iPod and an iPhone. Other iPod-compatible wares from CE powerhouses include LG’s PC12 Tabletop Audio System with HD radio; Samsung’s $500 RTS-A1100; Philips’ $200 BTM630 Bluetooth Wireless Entertainment System and $400 to $799 Ambisound home theater systems; and Sony’s XDR-S10HDiP HD Radio (which includes iTunes Tagging), CMT-BX20i, CMT-BX50BTi, MHC-EC98Pi mini HiFi, MHC-EC78Pi, and MHC-EC68Pi ($180, $130, $180, $200, $150, and $130, respectively). In addition, even when these companies don’t include an iPod dock, their new products often leave the option open. For example, Philips’ Streamium WACS7500 hub and WAS7500 extenders, which are designed to stream audio wirelessly around your home, support an optional iPod dock. And Sony’s Sound Wall RHT-S10 home theater stand, along with several other Sony AV products, include a new Digital Media Port that can be connected to any of a number of adapters—including one for the iPod. Suffice it to say, the iPod accessory market is still chugging along; 2008 promises more choices than ever for enjoying your iPod-hosted media. And Macworld Expo, which will bring even more new—and hopefully unique—iPod gadgets, is just a few days away. Updated at 3:40 p.m. PT to correct the caption for iHome’s iP51.